I have said in earlier posts that I didn’t grow up on soda or caffeine. It was probably a good thing because I am sure I would be a diet coke addict. I really can’t stand the taste and burning of your throat feeling. So our favorite thing to get in our house was strawberry lemonade or fruit punch. But I sure love strawberry lemonade and order it where ever we go. One of my favorite recipes on the blog is this strawberry lemonade. I literally can drink the whole pitcher by myself! I had some frozen strawberry lemonade this summer and loved it! It was especially refreshing in this hot and humid North Carolina heat. I knew that I had to make some at home and it was so easy! Literally in minutes I had a yummy sweet and tangy frozen drink to cool me and my boys down. We loved it! Take a few minutes to blend this together. You will love it too! A delicious frozen strawberry lemonade that is cool and refreshing for summer! 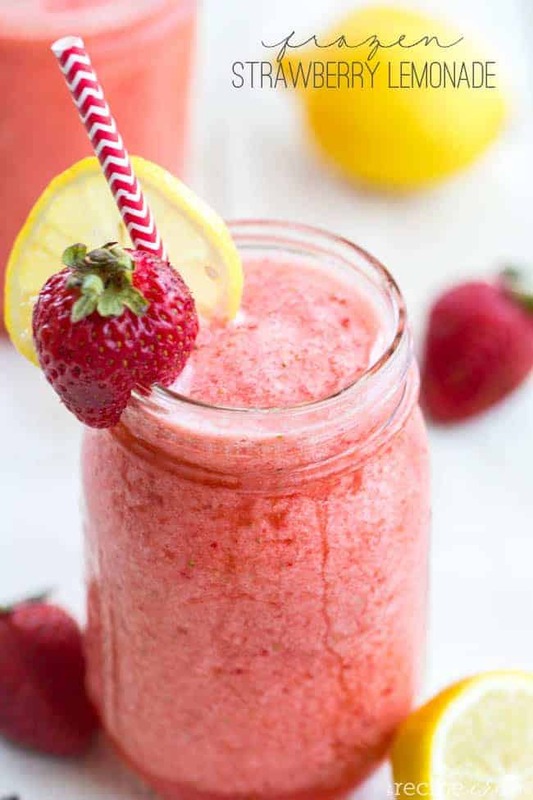 Place ice and water in a blender followed by frozen lemonade and strawberries. Blend until smooth. This looks so incredibly refreshing, perfect for the pool with my boys, love it! This looks delicious! It is heating up here too and we are getting a bit tired of ice tea. Thanks! This is soo easy to make! So simple and refreshing on a hot summer night! Loved it and will definitely make it again! All my college roommates loved this recipe.